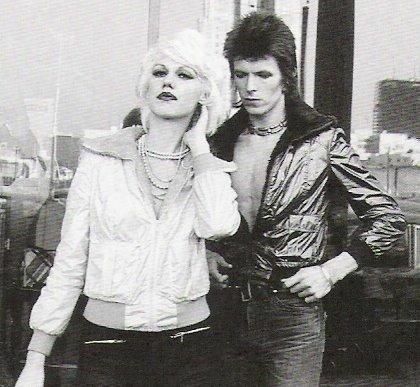 This entry was posted on Thursday, June 3rd, 2010 at 9:18 am and is filed under Aladdin Sane: 1973. You can follow any responses to this entry through the RSS 2.0 feed. Both comments and pings are currently closed. I once read that, at the final Ziggy show, the band was joined by Jeff Beck for a medley of “Jean Genie” and “Love Me Do” which could be found on bootlegs of the show. I’ve never come across this version, but man, I’d love to see/hear that! TOTP’s – audio only, no video. “The Jean Genie” is a blatant rip off of a song entitled “Oh Yeah”, recorded by 60’s US garage band, The Shadows Of Night. 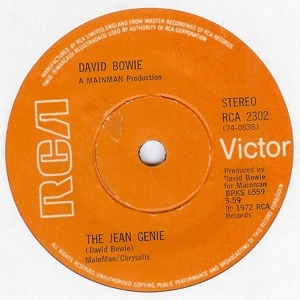 “The Jean Genie” is a better song, but it’s a steal. Am currently listening to Nuggets – the Lenny Kaye compiled US garage/punk rock compilation, that features “Oh Yeah”, by The Shadows Of Night, and was originally issued in 1972 (can’t find a release date anywhere). It’s pretty inconceivable that Bowie would have been aware of the original US 45, but this compilation was very well received and reviewed by the UK rock press at the time, and DB must surely have heard a copy, and the dynamics of the SoN version are definately ‘referenced’ at the very least on JG. By the by this compilation is some kind touchstone both for the beginnings of an appreciation and recognition of ‘rocks rich tapestry’, as well as being a key influence on US and UK punk bands in the mid/late 70s, not to mention the start of a whole re-issue industry. And it’s pretty much all freakin’ great too. Just listened to the Shadows of Night song Oh Yeah on my IPod and it’s obviously Jean Genie but I think it more likely that Ronson or someone else in Bowie’s entourage was more familiar with the Bo Diddley original than this cover.